Home »HOW TO LIGHT YOUR ROOM»Bedroom Lighting»Hotel Lighting create a boutique style bedroom. Create a boutique Hotel Style Bedroom. We’ve all stayed in grand hotels that are stunningly beautiful. Grand foyers with super large crystal chandeliers and beautifully lit reception area’s set the tone. Often vast swathes of marble and gloriously large light fittings greet you as you enter the hotel. You can see the bar clearly, the bar too, tempts you. You long to sit with your favourite beverage soaking up the plush cosy surroundings -all designed to make you tarry a while longer. What makes this all feel like such a treat? Lighting often is instrumental in creating the atmosphere hoteliers and guests so adore. As hotel guests we marvel at our surroundings and wonder why we didn’t do something like this in our own lounge, why we didn’t create such a wow in our entrance halls. But we all don’t have such grand budgets. We reach our bedrooms and this is the make or break for many, you want to stay or go based on the first impression of your room. Oh a hotel bedroom can be a wow! steady now! I am of course referring to the sophisticated colour pallets and stylish bedroom lighting. Addmitidley we all don’t have the luxury of interior designers to plan our space. No lighting designer! 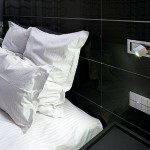 or architects to choose our bedroom lighting for us!. Having said that, we could do a whole heap better when lighting our own bedrooms, couldn’t we?, bedrooms, after all should be our sanctuary an escape to a relaxing space . A tiny bit of forward planning and a few well placed lights can create a boutique style bedroom design you’ll want to show off. Hotel Inspector has used lights from The Lighting Company. 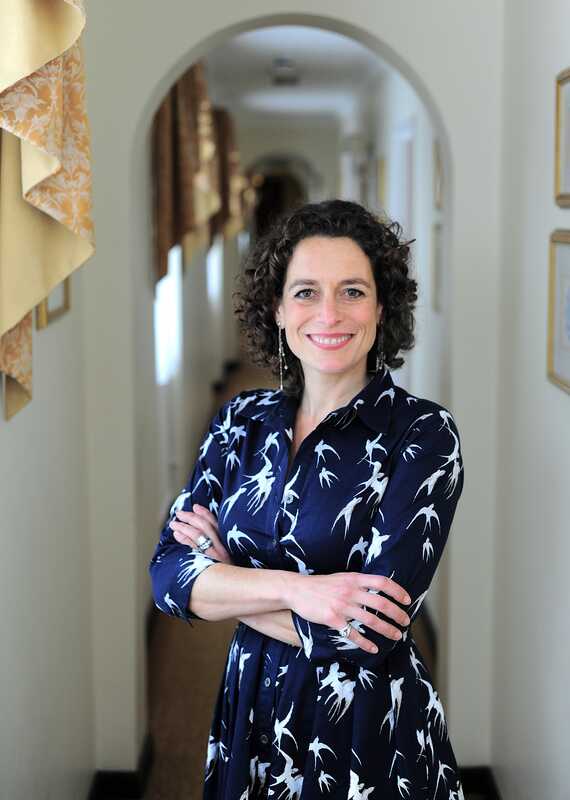 The Lighting Company whom supply many hotels, the TV programme ‘hotel inspector’ and numerous interior designers have put together a ‘top ten tips for creating a hotel style bedroom’. Ands it’s really not to difficult to achieve a well lit bedroom with a lovely boutique style. Looking at lighting this is a key element but will also offer some style tips too. Along with the ‘top 10 lighting tips for bedrooms you’ll see some super inspirational hotel style lights to peruse and maybe steal the idea’s for your own bedroom. From the hotel lighting suppliers The Lighting Company the top 10 tips for creating a boutiques style hotel bedroom. Get really good bedside lights. Light your make up or shaving area. Task lamp or desk lamp if your bedroom doubles as your office. Keep lighting (and surfaces) simple and unfussy for ease of cleaning. Have a common theme, don’t mis-match styles as this can make things cluttered looking. Concealed Reading Light perfect bedside light. May be mount Vertically for use as a library bookcase light. These should be fixed to the wall. The key thing here is to leave space on the bedside cabinets, for the paraphernalia needed during the night. When you’re younger you may just have a mobile phone, but as you get older other things are more important- a book, glasses, glass of water, pills and potions. Space is gained from on the bedside cabinets when lights are mounted on the bed head wall. Often hotel bedroom bedside lights are dual switched, so you can have a soft ambient light for snuggling up, romance or watching TV. While a smaller moveable light can be used as a reading light. Often the smaller reading light is LED which is cool to the touch. This not only saves money on the running costs but it avoids the risks of burning your hands on a hot bulb when you are feeling sleepy. One rather clever twist is to have hanging pendant lights, this is a visual treat but not as practical as bedside wall lights. When wall lights remain fixed, you are less likely to bash them, but pendants are a good alternative if a focussed reading light is not required or you favour lots of light, rather than a spotlight for reading. Simple neat easy clean bedside lights wall mounted. Have different lighting in different zones, we’ve mentioned bedside lights already. Make sure they can be switched off from the bed. It’s annoying to get back out of bed when you feel ready to sleep. Light the route to the bathroom. A small bathroom light or corridor light at a lower level may be useful, failing that, there are lots of plug in night lights on the market that are movement sensitive. This is a nice idea for young and old alike, young children like the comfort of a night light, while the rest of us hate full bright lights when we are feeling sleepy. More designer style sensor lights can be used in corridors if you are not lucky enough to have the hotel style en-suite but instead head off to the family bathroom in the night. Have desk or table lamps that may be switched on and off as required. The main lights can be switched off a section at a time if you are able to re-wire your bedroom but that a big job. An easier job would be to install a dimmer switch. Dimmers are fairly inexpensive all are compatible with standard tungsten bulbs but if you have low voltage or energy saving bulbs it is worth checking if the bulbs are dimmable with a standard dimmer or if you’ll need a specialist dimmer switch. We mentioned before dimming lights or switching them on and off separately. You may be able to re-wire your room completely and have a dedicated system for lighting controls. 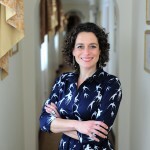 Many of us are doing a quick makeover rather than a complete renovate. That isn’t a problem there are lots of lights to choose from that can be switched by pull cord or little toggle switches from the light itself as long as you have cable you can normally add a wall light fairly easily. Replacing one light for another light is a simple job for an electrical contractor, electricians can do this type of job in less than an hour. 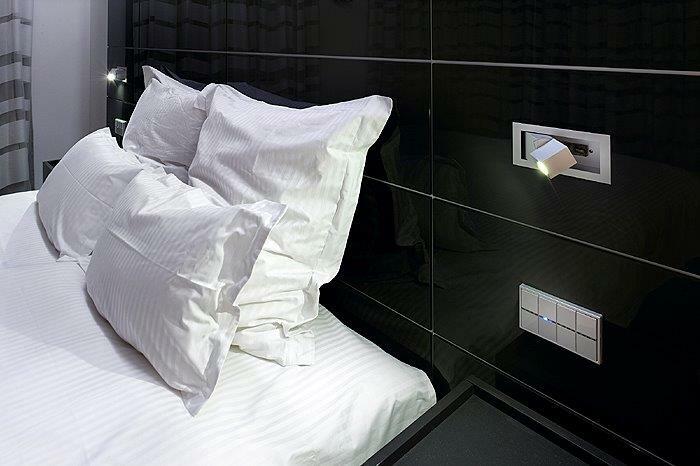 The ideal is bedside lights can be switched on/off from the bed. The centre or ceiling lights can be dimmed or switched off in banks or zones, you can see to dress and get ready in enough light. 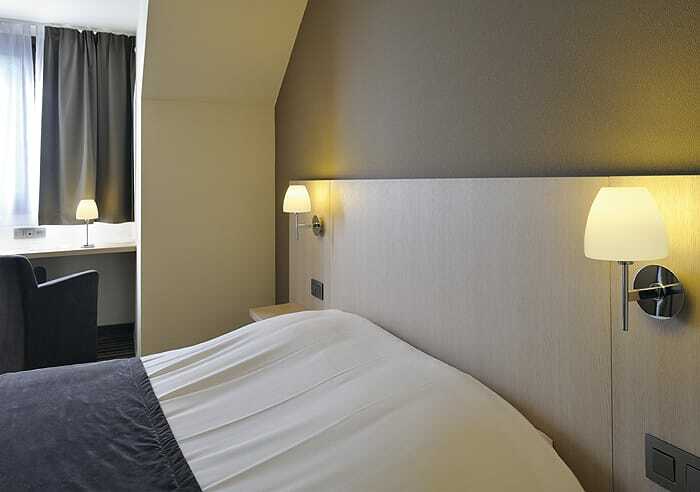 Desk lamps ideal for hotels switch is viable making use simple easy for guests to use. Little desk lamps are often used in hotels they nearly always point the light onto the table or desk top. This is because on of the occupants may be working and the other may be sleeping or watching TV. 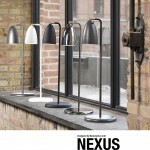 If your bedroom often ends up being where you work, read, draw etc add task lamps. If the room is especially large it is simply nice to have a little soft light to make the whole room feel welcoming. Add a small soft shaded lamp or maybe an unfussy uplighter to a corner of the room. This is a lovely effect washing the walls or ceiling with light. Again opt for dimmable, if you can. 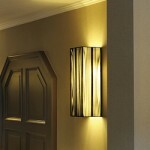 Lighting sales for hotels have clean lines which are easy to dust. They don’t have elaborate crystal chandeliers in most rooms, maybe in the grand suites where out and out opulence is needed, but quiet underrated quality is by far the favoured style by hoteliers. 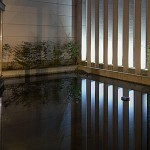 Keeping the lighting clean and fresh helps promote that well cared for look good hotels have. They do this by keeping the lighting simple in style, they’ll choose good quality lighting with wooden detail to make they clean simple styling ooze quality. Fabric shades are mainly muted colours cream or natural tones are good but colour too can be used, for a bold colour shot when the room needs to have some impact. The key is keep all lighting to a similar type either the same colours tones or materials. Have a common theme such as, all squared shades or all round drum shaped shades, all chrome etc. The simple styles work best in sets table lamps standard lamps and bedside lamps are often bought in sets and a small desk lamp completes a hotel bedroom light set when added to a few well placed recessed lights. Recommended ranges used in lots of hotels are the ZARAGOZA a good range with a cosmopolitan feel has across the board appeal but there are plenty of alternatives to choose from. Sometimes a bolder look may be used as a statement light this is often teamed with concealed lighting for a more boutique vibe. 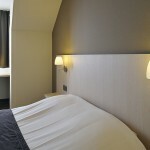 Concealed lights are perhaps better for home lighting as some visitors to hotels are less familiar with how they work. Light bulbs are now many and varied. Some light bulbs that may not be familiar to you are now common place whilst others are now rare as hens teeth. Be sure you opt for light bulbs that are easy to buy. Poorly specified hotel lights can be attractive yet the bulbs are rarely found in supermarkets. This means some carefully chosen lights are not useable. Many many hotels have bought lights without considering how easy it is to replace bulbs. Whilst low energy bulbs do offer lots of savings on running cost there are so many types it has caused too much confusion. Early style low energy bulbs were dedicated low energy and this type of plug in bulbs cannot always be bought off the shelf. I guess many hotels felt the bulbs would be less attractive to the type of customer that feels they can take little things as gifts from hotel rooms. The type of guest that takes the shower cap and soap is the norm, but some want towels, toilet roll holders and light bulbs!!! Shocking as it seems it does happen, poor hoteliers simply bought lamps with obscure light bulbs to prevent this. Often this results in faulty or deceased bulbs never being replaced. I guess while we are often delighted with our stay in a beautifully lit hotel room, we may have also experienced a dim dismal bedroom too. To avoid falling into this same trap we’d suggest buy retro fit bulbs. You can have retro fit normal tungsten bulbs or low energy. Think on hoteliers if your lighting is not working it’s time to change it! Us mere mortals are getting better at re-creating a good hotel style lighting scheme, you’ll need to crank it up a bit to stay ahead in the glamour stakes. This brings us to the end of your how to light a hotel bedroom masterclass. 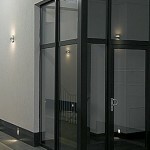 The Lighting Company also have bar lights, restaurant pendant lights, corridors lights and foyer and reception lighting. Bar lights, restaurant lights, corridor lighting.